We all know that the global retail landscape is getting smaller - distance is no obstacle when it comes to the permeation of brands. As a partner to many international retailers and brands, we understand the need to embody the spirit of globalisation to enable us to seamlessly land projects on an global scale. We are fortunate to have customers, stakeholders and contacts in every corner of the world, but the big question is how do we feel like a local support team to customers who are scattered across different continents? We have a customer delivery team who are super-dedicated to making sure that geography is immaterial when it comes to customer service. We speak over 25 languages within the company and with permanent teams based in both the UK and central Europe, we are always ready to deliver. We ship to locations all over the world daily and are adept at understanding different requirements for each market, such as developing bespoke planograms for activation in different countries, to maximise sales and brand recognition. A huge part of the shift towards globalisation over the past century has been technology, whether this be in the creation of commerical airliners, the development of the internet or the recent influence of social media on the shopping behaviours of consumers. At Kesslers, we are always striving to harness technology for the benefit of our designs and our customers; this is a key feature of our new showroom with the introduction of our Digital Lab, showcasing Augmented Reality (AR), Virtual Reality (VR), Near Field Communication NFC), and Internet of Things (IoT) connectivity. We had an amazing launch party in March, where we hosted guests to celebrate the completion of the re-brand and new Showroom, but we know that not everyone is able to hop over to East London to see it in person. 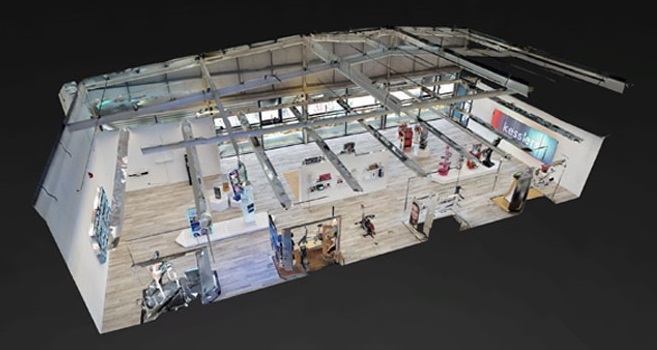 So, we are really excited to share a virtual tour of our showroom, which brings the display area alive on your device, without the need to even see the Tube! Visitors can wander round the Showroom and see what we've been up to recently. We collaborated with Local-X 360 Virtual Tours to get the space fully functional and easily navigable. It's also accessible on GoogleMaps and we think it's a great, simple way to show a practical application for a really neat bit of programming. Imagine your customers being able to browse beautiful catalogue rooms in-store and then being directed to the right area of the shop to effortlessly select the accessories that they want to buy. Or to be able to browse a catwalk of latest trends in an interactive shopping mall display and let shoppers know which stores are stocking the latest trends displayed. We love technology and seeing how it can help you establish and maintain relationships with your brand devotees, retaining currency and loyalty in the exciting retail sphere. Contact us to find out more.